As I drove down Campolindo Drive Tuesday morning, I spotted a gray fox ducking into a culvert under neighbors George and Earlene Grimm’s driveway. A week ago, I spotted a fox — possibly the same one — sitting in a field next to my cabin and being dive bombed by a couple of crows. The crows have a nest high in a nearby pine tree, but I doubt the fox could ever climb up to the chicks. All the same, it was yet another sign that young animals are everywhere around here at this time of year. 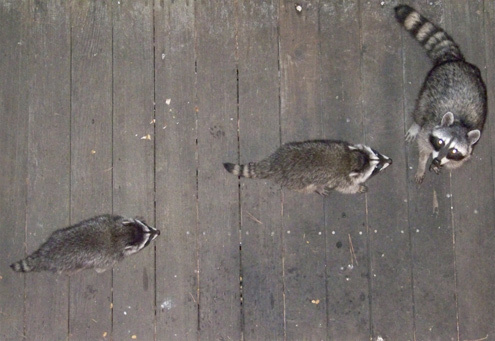 A female raccoon shows up on my deck almost every night, hoping I’ll put out bread or peanuts for her. Some of the raccoons on this hill are comfortable around me, but she isn’t and runs off a short distance whenever I open the kitchen door. Nonetheless, she chases off the raccoons that feel more at home at my place. Last night she surprised me by showing up with two kits, which were even more skittish than she. Both spent much of their time hiding behind my woodbox, watching their mother dine in the open. Raccoon kits are not always so timid. More than once I’ve had kits walk right into my kitchen when I left the door open. 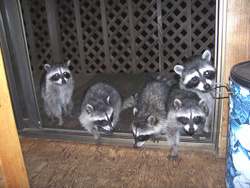 Raccoons breed from late fall into early spring, with females sometimes having more than one short-term mate. The gestation period lasts about two months, and litters typically range from two to seven kits. Kits are born deaf and blind. They do not open their eyes for about three weeks, a couple of days after their ear canals open. Raccoons around water often appear to wash their food. In Europe, where they have been introduced, the Germans call them “Waschbären,” meaning “wash bears.” However, researchers now believe they are not actually washing their food but their paws. 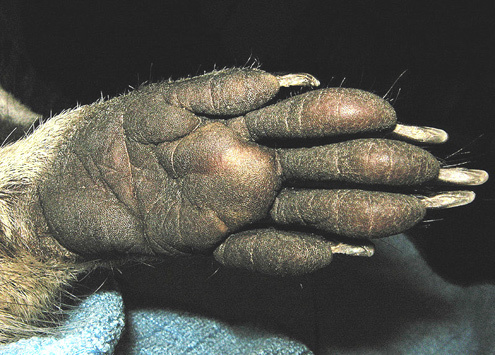 Just above their claws are stiff hairs called vibrissae, which have sensory cells associated with them. The vibrissae allow raccoons to identify objects before touching them with their paws. Washing keeps the hairs clean and sensitive. A blacktail buck beside my cabin last Thursday. If you’ve every wondered about the difference between a “buck” and a “stag,” the word “stag” refers to the male red deer of Europe, which is also called a “hart” when mature. In the past few weeks, I’ve also spotted a blacktail fawn on this hill, sometimes with its mother. Usually blacktail does have two fawns, but a couple of weeks ago, I saw a fawn, which had been killed by a car, lying beside Highway 1 near Campolindo Drive. I fear the worst. 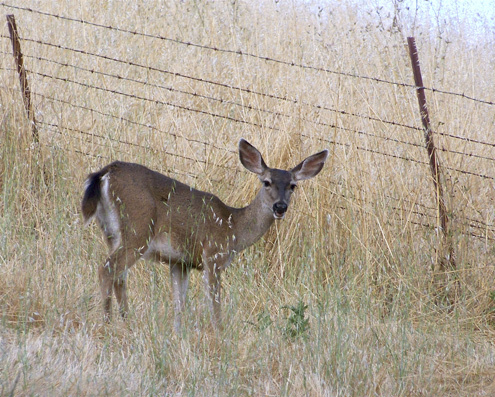 A blacktail doe at my back fence Sunday. Does give birth from late spring to early summer. “Hind,” as in the Golden Hinde Resort, is another word for “doe.” The resort in Inverness is, of course, named after Sir Francis Drake’s ship, which was named after the deer, and the name of the ship is sometimes spelled “Hinde,” as in London’s Golden Hinde Museum. Blacktails in the wild have typical lifespans of seven to 10 years while in suburban habitat where they feast on gardens, they can live for 17 to 20 years if cars or dogs don’t get them. Based on DNA tests, the magazine added, “researchers theorized that whitetails (Odocoileus viginianus) emerged as a separate species on the East Coast about 3.5 million years ago. 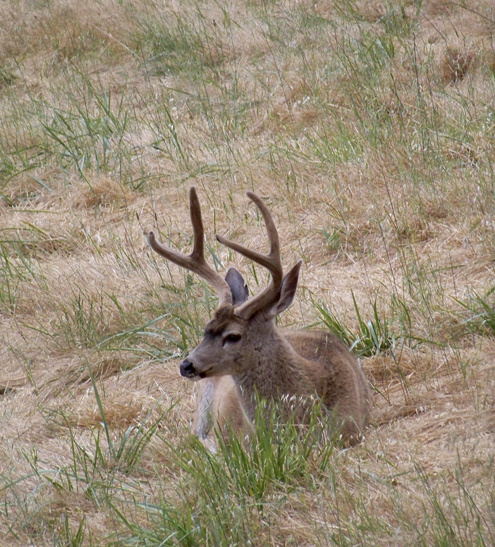 “Columbian blacktail deer (Odocoileus hemionus columbianus) are the subspecies of blacktails native to the Bay Area…. According to the California Department of Fish and Game, there are now approximately 560,000 deer in all California, about 320,000 of which are Columbian blacktails…. 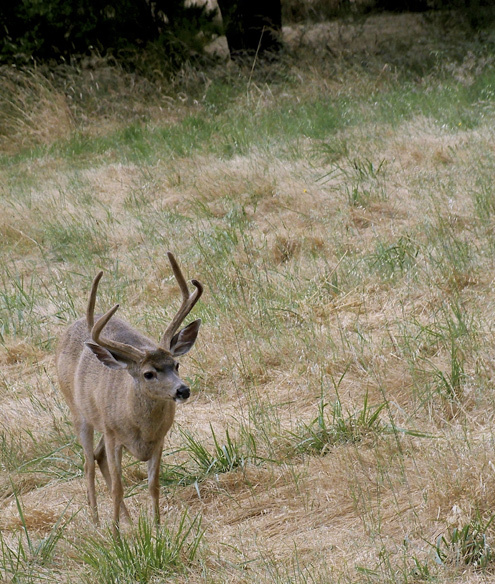 “Near the end of the Pleistocene, some 11,000 years ago, as the glacial ice receded from the Sierra passes, blacktails moving east from their traditional homes in the coastal valleys of California, Oregon, Washington, and British Columbia began to encounter a second wave of whitetails expanding their range westward across the Great Plains, Bay Nature added. At this time of year when there’s so many uncomprehending fawns boing boing-ing around West Marin, I urge drivers to slow down at night and use their high beams whenever possible. Hitting a deer is hard on your emotions, not to mention your car. I know; last winter I hit a young buck that jumped out in front of me on Lucas Valley Road. Great pictures, fascinating facts and good advice – thanks, Dave. Sparsely Sage and Timely is powered by	WordPress 4.9.10 and delivered to you in 0.538 seconds using 56 queries.